So I got the chance to go to Singapore last week. I made sure to drink at least one glass of iced tea with milk every day since I won't be able to do that locally. 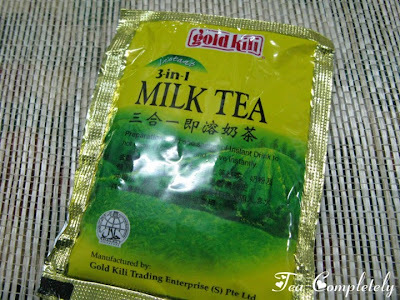 One of the things I made sure to look for was instant tea milk since I was quite disappointed with the last one I tried. I had a hard time choosing which brand to buy when we went to Cold Storage on Orchard Road. I wanted to buy several packs but was afraid of going overweight so I finally chose Gold Kili only because it seemed to be the most in demand (few left on the shelf). And it was a good choice. Tastes a bit sharp though. A teaspoon of condensed milk takes the sharpness out and makes it the perfect instant milk tea.